With Phase 1 of Staypineapple Boston pineapple-ization complete, we’re so excited to officially be part of Boston’s South End community. This means our guests at Staypineapple Boston will also be a part of this community, in a way, so we’d like to share a little history of the neighborhood and some of the businesses that have struck our fancy, impressing us with how they remember EVERYONE’S name who walks in the door. The South End neighborhood is built upon a former tidal marsh, similar to Seattle’s Pioneer Square, and was part of a larger project of filling Boston's Back and South Bays in the mid-1800’s. 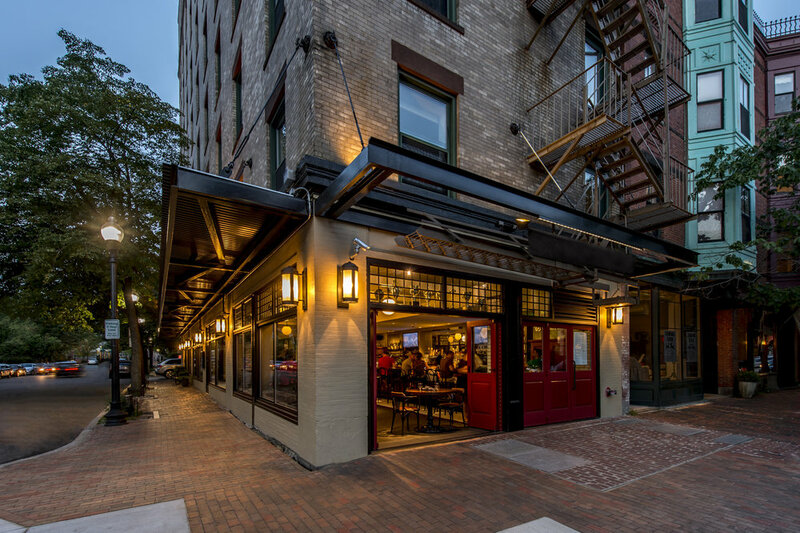 Fill was brought in by trains from large trenches of gravel excavated in Needham, Massachusetts to help Boston expand from its original roots located in current day Downtown. The South End was filled and developed before Back Bay, which was mostly built after the American Civil War. Of course we hope you get to explore the city while you’re in Boston, but as far as the stretch of Berkeley Street that runs adjacent to Staypineapple Boston, there’s plenty to like. Hardly just another forgettable hotel restaurant, Trophy Room, in the hotel, is the epicenter of fun for the South End neighborhood. A favorite of locals, it features a colorful atmosphere and imaginative food and drink. The dinner menu is a modern take on American classics, and a lively brunch menu matches the celebratory weekend atmosphere. It’s definitely not your normal, forgettable hotel food. This classy cafe with local artists featured on the walls has a simple menu with specialties named after neighborhood regulars. We were partial to the aptly named, Berkeley Omelette, featuring bacon, cheese, and onion topped with sliced avocado and toast on the side. All for the nice price of $7.50. Oh, so much more than subs. Specials included meatloaf, chicken à la king while the regular menu items included an All-Star American Top 20 list of sandwiches and a tasty gyro. Forget Spike’s favorite toy or want to treat your fluffy friend to a quick bath? D’tails Pet Boutique is conveniently located right next door to Staypineapple Boston and can fill any pet need that might happen while you’re in town. A few cobblestoned steps away from Staypineapple Boston is Delux, a colorfully lit corner bar with a smallish menu of fun comfort food like grilled cheese sandwiches and quesadillas. It gets packed though so be prepared to wait a bit if you’re not on the early or late end. Ranked in Thrillist’s top 21 bakeries in America, Flour Bakery + Cafe could be considered a high end establishment (think dark chocolate being spooned into your mocha) but that’s all good because their flavors and efficiency make it all worth it. On top of awe-inspiring pastries, they also boast fun, interesting sandwiches that go above and beyond bread and meat. Want a mani-pedi? A couple slices of pizza or upscale pub food? Tremont Street a few blocks south of Staypineapple Boston can fulfill nearly every need for someone willing to wander for their true calling. A little longer walk to Newbury Street (about 15 minutes) unlocks unparalleled shopping and local eateries as well as national favorites. Each are featured in the ever-common brownstone style normally reserved for Boston residences, and lights twinkling in sidewalk trees illuminate the way. Just going to say it - Shake Shack is on Newbury. One of the most historic parks in the country is just across a bridge and a few skips from the doors of Staypineapple Boston. Along with over-friendly squirrels, plenty of waterfowl (both real and bronzed), and the start of the Freedom Trail, you'll also find the Cheers bar just across the street waiting for you with a pint ready to go. Boston’s Chinatown is in the middle-of-it-all south of downtown, and a few blocks past the Mass Pike from Staypineapple Boston. If Chinese food isn’t your thing, don’t worry, there are notable pho’ and ramen spots as well to quench any specific broth cravings. A hearty walk (33 minutes according to Google) or quick rideshare gets you to the home of the Red Sox and one of the oldest stadiums in baseball. Plenty of time to warm your vocal chords up for every-game singing of “Sweet Caroline”. So there you have it. The South End is truly full of diverse people, food, and entertainment options. Next time you find yourself in Boston, we hope you get the chance to explore, and let us at Staypineapple Boston be the launching point for your adventures. As the pineapple-ization of Staypineapple Boston continues through the spring, we’re offering sneak peak specials, so if you’ve been thinking about visiting the capital of New England, there’s never been a better time!